In terms of safety, the most important thing for scissor lift and aerial lift operators is training. Without the skills and knowledge to properly operate machinery, accidents and injuries are inevitable. Ideally, you want OSHA compliant aerial lift and scissor lift training, which CMO offers for everyone involved with this type of heavy equipment work. But what is the second most critical safety factor for aerial lift workers and scissor lift employees? Personal protective equipment (PPE) is a strong contender for second place. Even with the best safety training methods, there’s a chance that something might go wrong. From a split-second on non-concentration to weather and much more, having an extra layer of safety protection really helps. Whether you work with power lines or on a construction site, PPE helps avoid injuries, falls, and other accidents. Since PPE is literally that extra layer of protection, we thought it would be a good idea to review some of this equipment you need to know about. Why is PPE so important, and what does the U.S. Occupational Safety & Health Administration (OSHA) have to say about it? OSHA’s guidelines for PPE are spelled out in 29 CFR 1910, the General Industry safety standard. This OSHA safety section also includes recommendations and requirements for forklifts, pallet jacks, and other industrial equipment – not just for scissor lift and aerial lift workers. PPE is an important part of 29 CFR 1910, and OSHA lays out the different types of PPE accordingly. There are more than a dozen major categories of PPE. 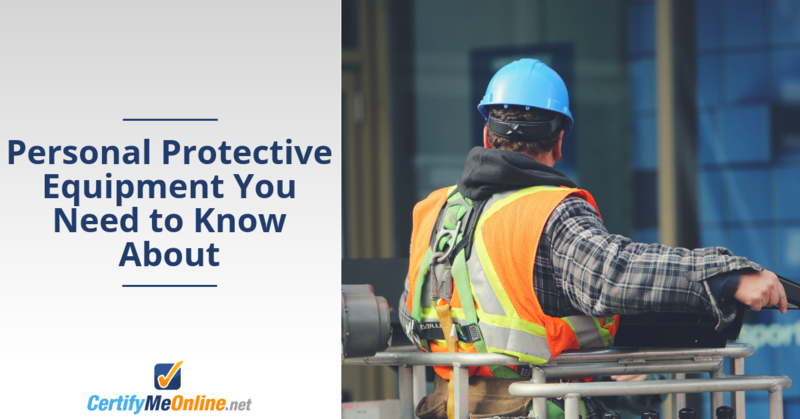 And since different companies and projects require different PPE, aerial lift and scissor lift operators need to know about PPE that can better protect them for everyday tasks, emergencies, and more. Let’s review some PPE you should consider for your job. Not every piece of this equipment may pertain to your specific duties, but having more knowledge about PPE is helpful, especially if your job changes down the road! Lanyards, anchors, harnesses, retractables, cable & rope grabs, and other types of fall protection PPE have saved more than a few lives on the job. For a comprehensive selection of fall protection PPE, click here. Plus, our resource page on this subject has some additional safety tips related to fall protection. OSHA’s Eye and Face Protection Standard spells out exactly what different types of workers need to stay safe on the job. Some of this equipment includes goggles, masks, eyeglasses, and much more. When you’re up on an aerial lift or scissor lift, it helps to have a firm and stable footing. Protective boots and shoes help employees from falling debris, the weather, heavy objects, and other hazards. Check out OSHA standard 1910.136 for more information on PPE for feet. If you’re involved with hazardous waste cleanup and other related projects, PPE requirements are mandatory. Within the category of PPE, there are subcategories devoted to protecting the entire body, from head to toe. OSHA’s Hazardous Waste PPE resource page has some great recommendations and tips & tricks on this subject. Aerial lift and scissor lift workers sometimes have to deal with subpar ventilation. From cramped workspaces to rising gases, having the right ventilation PPE is important. Gas masks, face protectors, venting kits and other accessories help ensure aerial lift and scissor lift operators literally have the breathing room to do their jobs safely & effectively. This type of PPE includes external equipment (venting kits are a good example) that aren’t worn personally, but provide personal safety. For a good overview of OSHA standards and helpful topics on PPE, visit the official OSHA PPE standards resource. With comprehensive training and a good understanding of PPE, you’re better prepared to handle normal tasks and emergency situations. Regardless of your aerial lift and scissor lift tasks, the combination of thorough training and PPE is an effective one-two punch against accidents and injuries. We can help with both. Our training is used by companies all over the U.S. for OSHA compliance, and it also includes helpful content and lessons related to PPE. Get started today with your aerial lift and scissor lift training! OSHA compliance is mandatory for everyone working on this equipment. For any questions about our training or PPE, give us a call at (602) 277-0615). This entry was posted in Aerial Lift Certification on September 21, 2018 by admin.